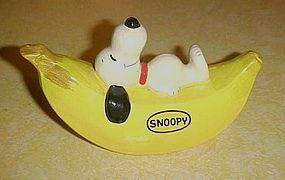 SNOOPY BANANA BANK This is a 4" tall by 6.25" long composition bank showing Snoopy contentedly lying atop a banana. One side of the bank bears the coin slot; the other bears his name in an oval decal. The original generic black rubber stopper is gone. Does have the original gold foil sticker that says "Hand made in Korea". This item was manufactured during the 1970s as part of the Snoopy fruit bank series, which also showed our hero atop an orange, an apple, a strawberry, and a watermelon slice. This bank is in virtually perfect condition with the exception of the missing rubber stopper.